DENVER – Gail Bell is a lover of dogs and the 55+ living community where she bought a home in Green Valley Ranch, but says what she's been dealing with the last five years has been no treat. "Had I known about the situation, I probably would have decided against purchasing here," said Bell. The situation is her property taxes and she's not talking about what she pays to the city or for local schools. "[I pay] just under $6,000 in taxes, of which two-thirds went to the two metro districts that we're in," Bell explained. What is a metro district? HBO's John Oliver did a recent episode focused on metro or special districts, and summed it up well. "Special districts are small units of government with the power to take tax dollars to do one specific thing," Oliver points out during the episode. "You've probably heard of a fire district, or a water district, but they can be setup for almost any purpose and there are way more of them than you think." 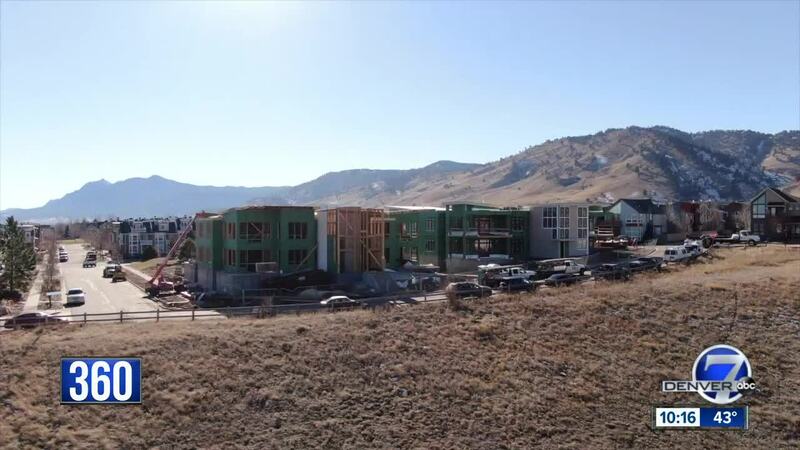 In Colorado, special districts are often used as a way for developers to finance the costs of building new housing communities on undeveloped land. According to state law, developers must provide at least two services in order to create a metro district . Think new sidewalks, roads, green space, fire protection districts or water services. Each district also must file a transparency notice with the Colorado Department of Local Affairs (DOLA). Those forms can be viewed online. The Special District Association of Colorado said it has over 2000 district members and also includes searchable transparency notices on its website. The developer then must create a service plan with a description of the proposed services, a financial plan, and estimate of costs, among other things. Local elected leaders are tasked with approving the creation of these districts based on the proposed plans. For Bell, she said her biggest problem was with the lack of transparency when she bought her Green Valley Ranch home. "I think they work tremendously for developers," she said. "I was told approximately $50 a month, obviously, that was a gross misconception." Up until recently, when her metro district was able to refinance their bonds at a lower rate, Bell said she was paying $500 a month in property taxes. Ninety extra mills were going solely to her metro district, bringing her total tax to 167 mills – more than double the 77 mills most Denver homeowners pay. "Even though people can afford to buy these houses, many of them can't afford to continue to live in them because of the taxes," she said. "[It’s] a system of taxation without representation that we have virtually no voice about how our tax money is spent." Bell points to the fact that members of the Metro District Boards, who oversee where and how their tax money is spent, often work or have direct ties to the developer. "I have attended their quarterly meetings from the metro districts [and] asked many questions over and over and over again with literally no change, and no response," she said. "There doesn't appear to be any entity who actually holds these districts accountable when there are issues such as conflicts of interests." University of Denver finance professor Mac Clouse agrees that developers have a leg up but sees that they serve their purpose. “We need someone to build the roads and the parks, and the green belts, and all the things that are necessary for a housing development,” he said. He believes metro districts have been key to the metro-area’s development boom and that infrastructure spending would be added to housing prices if they weren’t added to a special district tax. Still, he agreed that homeowners “need to know what they’re getting into” when it comes to the special districts. "Ultimately, homeowners will see it either in the form of a tax payments to make payments on the bonds or they would have seen it in higher housing prices,” Clouse said. Denver Post Editorial Page Editor Megan Schrader recently penned an op-ed against the special metro districts. She found there are more than 400 special districts in the metro area and that in just Arapahoe, Denver, Jefferson and Adams counties, taxpayers forked over $237 million to the special districts in 2017 alone. Schrader believes developers are essentially using the districts to pass the risk and debt onto taxpayers. A recent law change requires some disclosures at the time of closing about the special district taxes. Buyers have to be notified in the fine print of the housing contract that the home is in a special district. There is also a new cap on how many mills can go to debt services. But Schrader says she thinks the law needs to be strengthened. “I think it should be disclosed by law in MLS what the mill levy is and what it goes to, and also, I think it should be required to have a breakdown of what that is per year,” she said. Denver City Councilwoman Debbie Ortega agrees with Schrader’s last point. “That information needs to be carried across the board regardless of who is carrying the building and selling,” she said. She has approved several metro districts that have come before the council – most recently the River Mile development where Elitch Gardens sits currently. But while it is up to elected officials like her to sign off on the districts, Ortega believes that since the creation of the districts is enshrined in state statute that there are few tools that people can use to push back against developers that meet the requirements to form the metro districts. “Once they’re created, they operate like a separate unit of government within their city,” she said. So are these districts simply necessities in a booming Front Range where communities can’t go up fast enough or an overreach lawmakers need to reel back in? For Bell, after five years, she says she needs to see more from local governments or the state.